In order to make something similar for the XR, they need a bike in their workshop. It would only take an hour there to make up the link pipe. If I lived anywhere near them I would have my bike into them in a flash - however I don't and I'm about to go away for a protracted period with work etc - so it doesn't work for me - however if you are interested and are able to ride there for this can or indeed any of their other cans on here http://www.maxtorquecans.com/ give Martin a call on 01704 893337 and he will sort you out, maybe with a bit of a discount but thats between you and him. I have no vested interest in the company, just a very contented customer over the years who lives too far away !! Interesting profile. Do they give you any numbers regarding how the HP is affected? I wouldn't put that monstrosity on my bike if it was a quarter of the price of the Akra! I don't know - not much I'm sure - however you'd have to check with the company. Each to their own, I quite like it. The Akra is boring, and there's nothing else out there at the moment. 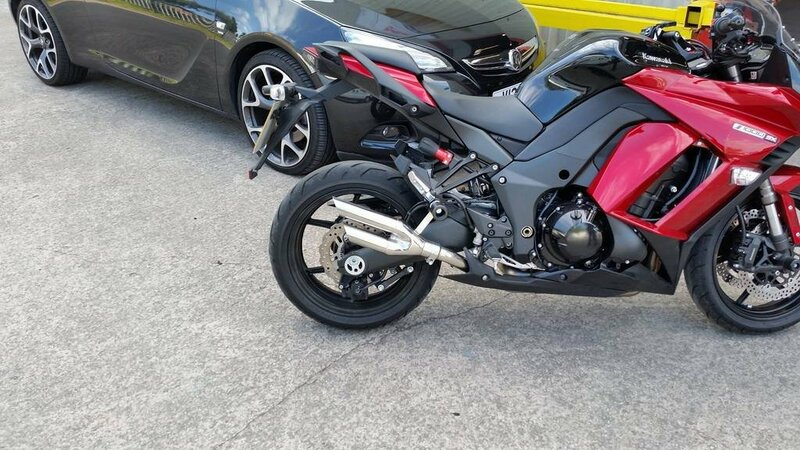 Yoshimura will be along with a thing of beauty before long or termignoni ! Redrick is right.......either Yoshimura or someone else will be coming out with something in the near future that will have us all panting. Very surprised to say that Akra, for the money, seems a bit of a disappointment in the appearance department. Bet it sounds sweet though!!!!!!!! Bet it sounds sweet though!!!!!!!! With the baffle out on mine, it sounds truly epic, on full chat! The Akra/baffle out on the 1300S was da bomb!! Couldn't get enough of it!